The Fouke Monster finally exposed! Let me tell you something about Charles B. Pierce (rest in peace). His son’s name is Chuck Pierce. His grandson’s name is Chuck Pierce Jr. Oh yeah, he also made a crappy movie about Sasquatch. The Legend of Boggy Creek is another one of those historical curios. In the early 70s it played a lot of drive-ins, and it was rated G, so a lot of kids saw it. As a result, many people grew up with a special place in their heart for the flick, as it was the first movie to truly scare them. I am forced to agree – this movie will absolutely scare children, no doubt about it. But if you’re older than 10, it will frighten you in a different way – namely, with the depth of its incompetence. I honestly don’t know what to make of a film that has an entire song dedicated to the character of Travis Crabtree, a dude who is in the film for a grand total of 5 minutes. 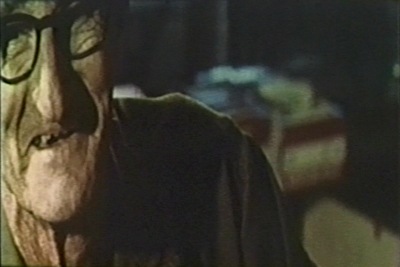 Boggy Creek plays like a pseudo-documentary. Pierce has most of the actors playing themselves. People who come from the swamps of Arkansas, mind you. 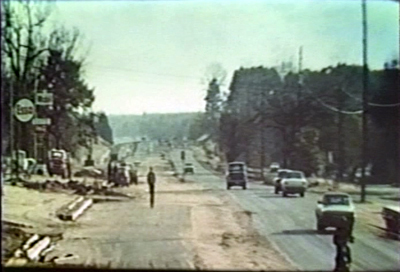 It seems that Fouke, Arkansas, a town where apparently the only profession available is hunting, developed a problem in the 1940s with a creature looking like Bigfoot walking around the place. 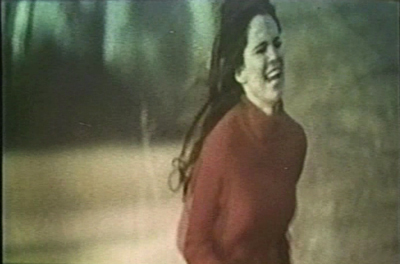 The movie covers the sightings of the “Fouke Monster” through interviews with people who remember seeing the creature. Between the interviews are long shots of Arkansas swampland scored to crickets, frogs, and the occasional folk song. 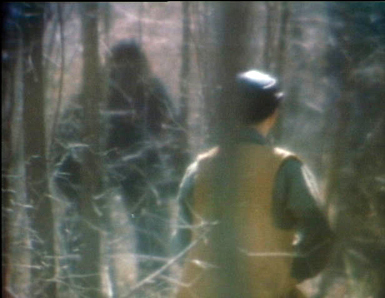 Boggy Creek wants us to believe that the Fouke monster is a dangerous creature, even though for about 3/4 of the picture the worst thing the monster does is wander around aimlessly getting shot at by hunters. The best evidence yet that this horrible movie exists! Only towards the end of Boggy Creek does the movie change gears to recreate the scene from the supposed attack on the Ford family in 1971. To his credit, Pierce wisely avoids lingering on shots of the creature for too long (which would have given away the gorilla costume). The movie finally finishes where it began – with the monster “out there” somewhere and nothing else of any consequence happening to anybody. 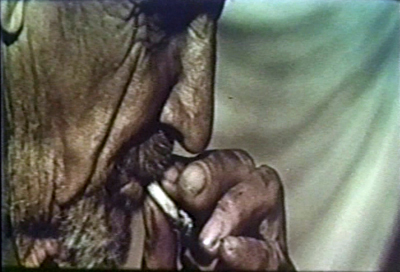 The only thing I really enjoyed about this 16mm feature was the theme song, which is catchy, and the fact that our narrator attaches extreme significance to every mundane non-event that happens in the film. Of course, if you really lived in Fouke, I suppose even the most mundane happening would be big news. I am not kidding you when I say that I was only 15 minutes in and it felt like an hour. This movie is guaranteed to cure insomnia, so for those with sleeping problems – please put your pills away and pop in this flick immediately. I would venture to guess that Boggy Creek is a favorite with people in Texarkana because Fouke makes Texarkana look like New York City in comparison. Pierce would later go on to make The Barbaric Beast of Boggy Creek, Part II AKA Boggy Creek 2 – and the Legend Continues… , which was completely savaged by Mike and the bots on Mystery Science Theater 3000. He was also responsible for The Town That Dreaded Sundown , a film that partly inspired Friday the 13th Part 2, believe it or not. See? That’s more interesting than the Fouke Monster!